Members of He’Sapa Oyate take a break from their weekly meeting held at Black Hills State University – Rapid City on March 3. Since coming aboard six months ago, the student success advisor and disability liaison for the BHSU-Rapid City campus Valeriah Big Eagle has made large strides. The Native American Club on campus, which serves students from the tri-umbrella of SDSU, USD, and BHSU, is her latest venture. As a first-generation college student, Big Eagle asked herself what she could do to help Native American students feel welcome, and become more involved on campus. Big Eagle knew the Native American population residing in Rapid City was high, so she began looking at the center’s student numbers. By dissecting BHSU Spearfish’s student attendance serve list Big Eagle was able to ascertain that 65 Native American students currently attend the Rapid City campus, but that doesn’t include the other two schools housed under its roof. Having other students who relate to your background, history and culture is important to retention and inclusion. 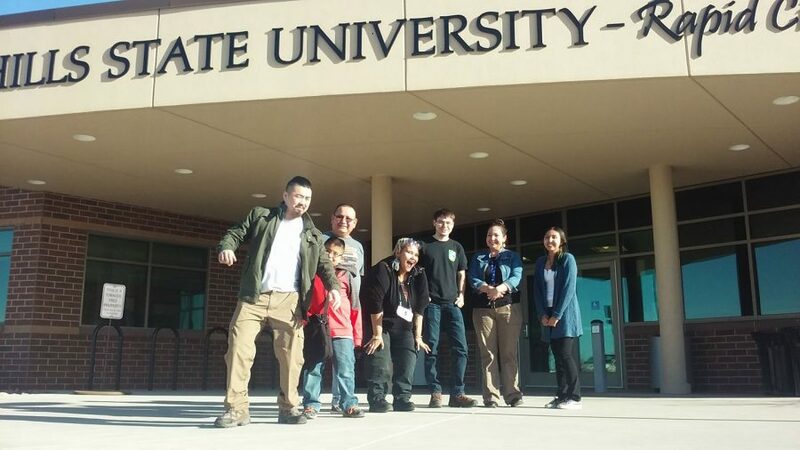 Cathy Payne, program advisor for Veterans Upward Bound housed on the BHSU-Rapid City campus agrees that the Native American Club is a big plus. “Similar to what I’ve witnessed within student veteran groups on campus, the Native American Club that Valeriah has launched will have a positive impact on her students’ retention and academic success,” Payne said. While working full-time at the BHSU-Rapid City campus, Big Eagle is currently pursuing a master’s degree in counseling and human resource development with a specialization in student affairs from SDSU. She is also the mother of three children ages eight and six years old and 14 months. “It’s about pride. We survived this cultural and historical genocide. It’s a support group for other Native students,” she said. Though having no actual dedicated room for the Native club, they have been meeting in classrooms. They had their first meeting Jan. 20 and five students were present. Big Eagle is serving as advisor to the group, letting them set their own agenda. “I gave them the reins, it is whatever you want it to be.” she said. She encourages them to take on more responsibility as a professional student organization by having officer positions. She also encouraged them to think big, getting involved in community events, such as the Lakota Nation Invitational or the downtown Native American Parade during the Black Hills Powwow. Oglala Lakota business administration and accounting major, Nicole Big Crow, is excited about the new club and plans to attend the upcoming social. “This club helps us,” Big Crow said. “It will give us encouragement to keep going because it’s tough.” The mother of seven and a grandmother is two years in to her four-year bachelor’s degree. “I already see having star quilts made in the three school colors for the walls of our space,” Big Eagle said. She wants to give students hope. With a modest sign-in sheet at the first meeting, Big Eagle hopes for growing support. Her passion has always been with Native students in both middle school and higher education. “Eventually the more people that come to the meetings on Friday at 1 p.m., the more the director here, [Gene Bilodeau, executive director-BHSU-Rapid City] will see the importance for The Native American Club to have their own space,” she said.